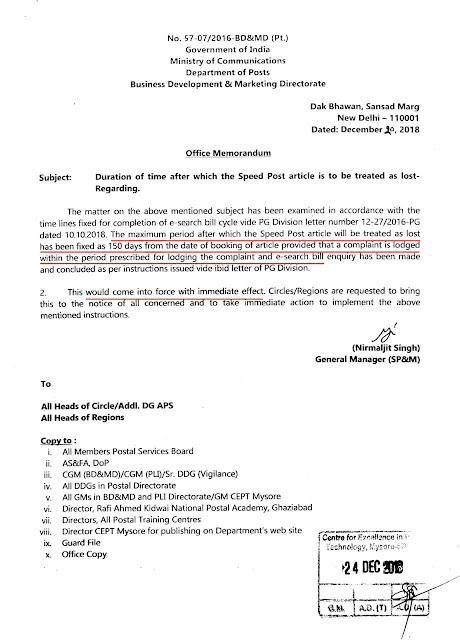 Subject: Duration of time after which the Speed Post article is to be treated as lost-Regarding. The matter on the above mentioned subject has been examined in accordance with the time lines fixed for completion of e-search bill cycle vide PG Division letter number 12-27/2016-PG dated 10.10.2018. The maximum period after which the Speed Post article will be treated as lost has been fixed as 150 days from the date of booking of article provided that a complaint is lodged within the period prescribed for lodging the complaint and e-search bill enquiry has been made and concluded as per instructions issued vide ibid letter of PG Division. 2. This would come into force with immediate effect. Circles/Regions are requested to bring this to the notice of all concerned and to take immediate action to implement the above mentioned instructions.